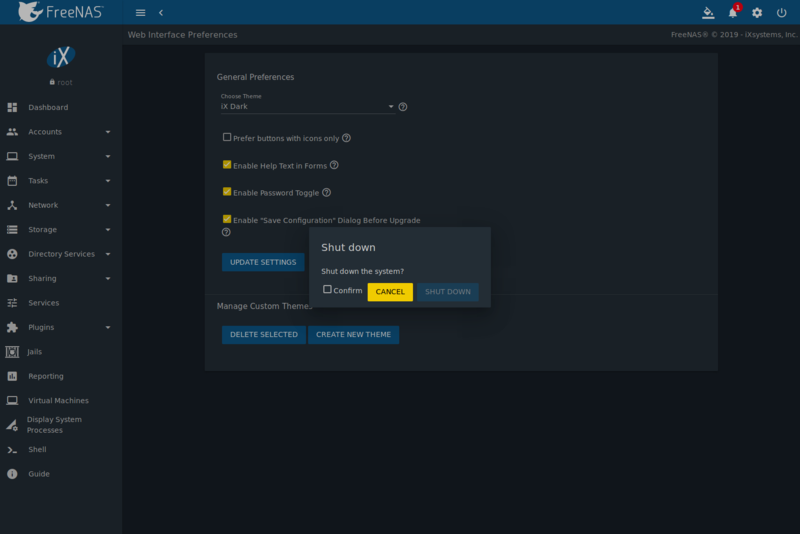 The ⏻ (Power) button is used to log out of the web interface or restart or shut down the FreeNAS® system. To log out, click ⏻ (Power), then Log Out. After logging out, the login screen is displayed. To restart the system, click ⏻ (Power), then Restart. A confirmation screen asks for verification of the restart. Figure 19.2.1. Click Confirm to confirm the action, then click RESTART to restart the system. An additional warning message appears when a restart is attempted when a scrub or resilver is in progress. When that warning appears, the recommended steps are to CANCEL the restart request and to periodically run zpool status from Shell until it shows that the scrub or verify has completed. Then the restart request can be entered again. To complete the restart request, click the Confirm checkbox and then the RESTART button. Restarting the system disconnects all clients, including the web administration interface. Wait a few minutes for the system to boot, then use the back button in the browser to return to the IP address of the FreeNAS® system. The login screen appears after a successful reboot. If the login screen does not appear, using a monitor and keyboard to physically access the FreeNAS® system is required to determine the issue preventing the system from resuming normal operation. Click ⏻ (Power) and Shut Down to shut down the system. The warning message shown in Figure 19.3.1 is displayed. Click Confirm and then SHUT DOWN to shut down the system. Shutting down the system disconnects all clients, including the web interface. Physical access to the FreeNAS® system is required to turn it back on.